As part of my preparation for the SCBWI - New York conference, I'm thinking about questions that might come up in conversation with other attendees. But it occurred to me that these questions aren't so different from the questions that non-writers ask me about my writing. For more, visit my post today over at the MiG Writers blog: Questions A Writer Should Know How to Answer. I'd love to hear some of the tricky questions people ask you. Bored by homework and bullied at school, twelve-year-old Gwyn Rae reluctantly takes on a Heritage Fair project to boost his history mark. He begins to investigate the papers of his ancestor, Daniel Rae, with help from his older sister, Maddie. Together they discover a notebook filled with writing only they can see and an iron key that seems to react to their touch. When the key unlocks a secret door in an old church, Gwyn and Maddie are launched into the adventure of their lives. It’s interesting the way the author tied magic and dragons to history. This is not a fast-paced story, but I was intrigued by Daniel and Maddie’s special abilities and wanted to keep reading to find out more. I liked the way Daniel and Maddie were depicted as part of a family, with their parents having a presence in the story. The bullying and environmental issues in this story make it a good book for discussion in a classroom. As a writer, I liked the idea of bringing history into fiction. I thought the dialogue was realistic and studied the way the author was able to tell so much of the story through dialogue. Janet McNaughton lives in Newfoundland. Dragon Seer’s Gift is set in her own neighbourhood in St. John’s. You can take a visual tour of some of the places in her book on her website. Dragon Seer's Gift also won the IODE Violet Downey Book Award and was named as one of three honour books for the Canadian Library Association's Book of the Year for Children in 2012. For more about Janet McNaughton, check out her website. 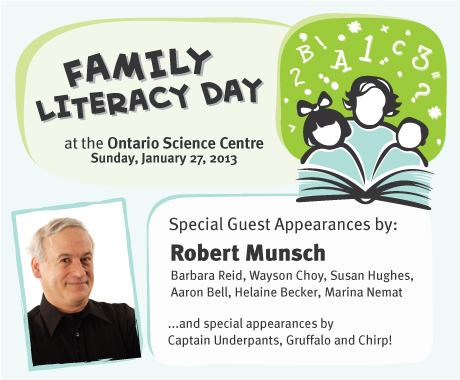 Today is Family Literacy Day!! "Family Literacy Day is a national awareness initiative created by ABC Life Literacy Canada in 1999 and held annually on January 27 to raise awareness of the importance of reading and engaging in other literacy-related activities as a family." (from the Family Literacy Day website). The idea is that taking even just 15 minutes a day to spend time together reading or another literacy activity can help improve a child's literacy skills. There are events planned all over Canada to celebrate. I love the idea of celebrating reading, so I'm going to break out a new book and dive in! (But I'm sure I'll be reading for longer than 15 minutes). It would be cool to get everyone in my family reading at the same time. I'm also likely going to be playing some board games with my teenagers (another fun literacy activity). This week was intense for my "day job" and on top of that, I totally lost my voice, so there wasn't much writing happening over here. But in the midst of not-writing, I did have a couple of flashes of brilliance. This one was thanks to Project Mayhem and their "I Have A Dream" contest. In the process of rewriting my query once again to enter (because I hadn't revisited the query for a over three months and I'm a little obsessive about these things), I suddenly got a flash of brilliance. Okay, it remains to be seen whether it is brilliant or not, but now I know how tweak the novel to bring out something that was missing from my main character's motivation. So, participating in the contest was definitely worthwhile. Thank you, Project Mayhem! Writing Tip: If you get stuck when revising, going back to the query can help keep you focused on where the story is going. See also a great blog post on this from writer Janice Hardy in a guest post over at QueryTracker: How Much Can You Really Tell From a Query? Sometimes keeping something in your novel because "it's cool" can lead to problems. The character ends up doing something to fit the cool scenario instead of the story coming from the character. In my second flash of brilliance this week (and again, it remains to be seen whether it really is brilliant or not), I realized that one of the "cool" scenes in my novel didn't fit. I ended up cutting and rewriting to create a couple of scenes that fit better with what my character wants, making her reasons for acting much more personal and meaningful to her, and not just convenient for the plot. It's so great that what I'm learning about from blog posts and my reading -- I'm currently reading agent Mary Kole's Writing Irresistible KidLit -- is finally starting to sink in. Writing Tip: It really does all come back to what the main character wants, because that's what drives her decisions and actions. So, when was the last time you had a flash of brilliance? Although I’m more of a dog person, I could sympathize with the hard life experienced by the stray cats and I was rooting for Billy to help find a solution. Billy’s character was believable, and so were his friends Luke and Salome. For me, Billy’s father was less convincing. I found it hard to accept when he abruptly changed his perspective after one story event, but other readers might not mind this if they are caught up in the story. 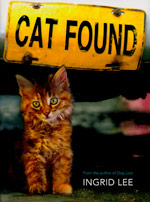 Cat Found has a clear message about spaying and neutering, and highlights issues related to cruelty to animals. Some parts of this story may not be appropriate for younger children - there are two scenes of cats giving birth, one including a stillborn kitten, and the other where the cat dies. As a writer, I liked the way the author tackled real issues and didn’t sugar coat the hard life of the cats. She used details carefully to present a picture of the events that wasn’t overly gruesome. Ingrid Lee lives in Toronto. Her first book for older readers, Dog Lost, is based on a true story. This book is nominated for the Ontario Library Association's Forest of Reading in the Silver Birch (Fiction) category for 2013. If you aren't familiar with the Forest of Reading program, here's how it works: Professionals from schools and public libraries nominate a selection of books in a specific category. Students from all over the province read them and then in April they vote for their favourite. I have previously profiled A Tinfoil Sky by Cyndi Sand-Eveland. For more about Ingrid Lee, check out her GoodReads profile. The dabbawallas of Mumbai deliver box lunches — called tiffins — to whitecollar workers all over the vast city. They are legendary for their near-perfect service: for every six million lunches sent, only one will fail to reach its intended destination. 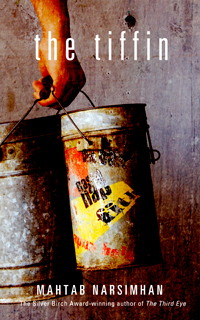 The Tiffin is about that one time in millions when a box goes astray, changing lives forever. When a note placed in a tiffin is lost, a newborn—Kunal—is separated from his mother. Twelve years later, Kunal lives as a virtual slave under the thumb of his foster father, Seth. With danger and oppression making it impossible to stay where he is, Kunal asks his friend Vinayak, an aging dabbawalla, to help him find his birth mother. Vinayak introduces Kunal to the tiffin carriers, and a plan is hatched. Along the way, Kunal learns what it means to be part of a family. I enjoy reading books where I get a glimpse of what it’s like to live in a different country, and this story did a great job of bringing to life the city of Mumbai, especially a side of it that a tourist wouldn’t experience. I liked the way the author included authentic Indian vocabulary (and a glossary at the back for difficult words). Kunal’s dream of finding his family was easy to relate to and I was intrigued by the idea of the tiffin and how it helped solve his problem. This book provides many opportunities to think about social issues such as child labour and child abuse. As a writer, I enjoyed the way the details about Mumbai and Kumal’s life transported me to another place. Although some elements of the plot seemed a bit of a stretch, the setting and characters kept me hooked on the story. This novel is a good illustration of how the elements of character, setting and plot work together to keep the reader interested. Mahtab Marsimhan was born in Mumbai and immigrated to Canada at the age of 25. She now lives in Toronto. Her first book, The Third Eye, won the Ontario Library Association’s Silver Birch Award in 2009. The Tiffin is a finalist for the 2013 Red Maple Fiction Award, part of the Ontario Library Association’s Forest of Reading. It was also a finalist for the 2012 CLA Book of the Year for Children Award, shortlisted for the 2013 Manitoba Young Readers Choice Award, and named a Quill & Quire Book of the Year for 2011 (Books for Young People). In an interview with Daytime Toronto on her website, Mahtab says she works by writing down the story first, and then polishing the draft to make it better. For more, visit Mahtab Narsimhan’s website. I heard an interesting podcast this week from CBC radio on Questioning Teen Sick-Lit. I hadn't realized there was so much debate about topics of suicide, cutting, abuse, cancer, etc. in YA novels. But some people think these kinds of books can be dangerous for vulnerable teens by amplifying what they are feeling. This discussion included perspectives from Amanda Craig, a children's book reviewer for The Times of London who refuses to review books about teen death and believes they can be harmful; the general manager of Mabel's Fables book shop in in Toronto, Melissa Bordon-King; and a teen perspective from 17-year-old book critic and blogger, Robby Auld (robertault.blogspot.com). I liked this comment Melissa Bordon-King offers to customers and parents: "Literature is the safest place where we can explore the world's hardest issues." See also this article by the Guardian, 'Sick-lit'? Evidently young adult fiction is too complex for the Daily Mail. In just 23 days, I'm going to a big SCBWI conference for the first time ever! I'm so excited because this is something I've always dreamed of doing. But I'm also nervous, because it's been a long time since I've travelled anywhere by myself, let alone to huge conference like this. Luckily, I used to live in NYC many years ago, so I'm trusting that I'll still be able to figure out where I'm going. 1. I ordered business cards. All the advice I've read about going to a conference suggests this is a good idea, so you can easily exchange contact info with people you meet. 2. I'm trying to finish revising a novel I soon want to start subbing, because I'd love to be able to talk about this one to other writers and people I meet at the conference. I'm also working on perfecting the short "elevator" pitch and summary, just in case, even though I'm expecting mostly to be there to soak up all I can about writing and publishing. 3. I've been practicing the answer to the question, What do you write? It might seem crazy to practice this, but I can imagine myself being all tongue-tied and mumbly in the presence of other writers who are much more successful than I am. Have you been to any writing conferences? What did you do to get ready? “Good” gets rejected. Your work has to be the best. I'm choosing this for my Cool Blog Quote for the month of January, because it reminds me that being a writer is about continually trying to improve and challenge myself to be more creative. Even though the struggle to be a better writer sometimes seems so hard I just want to crawl under a blanket and read an amazing book that someone else wrote, most of the time I'm thinking about how I can make my story better, stronger or more compelling. And I know it's possible, if only I can write my way there. One of the things I do to help keep my writing on track is to set writing goals. I find I'm more productive when I'm working towards something specific. My goals for 2013 are posted over at MiG Writers - The MiG's 2013 Goals. I'm so lucky to have great group of writing friends to help support me as I work towards achieving my goals! I think I would have stopped my writing at "Good" or "Slightly Worse Than Good" a long time ago without them to cheer me. So I'm passing along my wish for you in 2013 - that you have success in making your writing better and stronger than it has ever been before. 1. Writing a new middle grade novel that I've been thinking about for a couple of months. 2. Reading all the books nominated in the Silver Birch Category for this year's Forest of Reading from the Ontario Library Association. The goal of this initiative is to encourage a love of reading. Over 250,000 readers participate annually and can vote on their favourite book in different categories. Silver Birch is the middle grade category. The winners are announced at a big celebration in the spring. I can hardly wait to read these!